We had the opportunity to present the Velumo at the official inauguration of Flanders Bike Valley’s windtunnel and BikeVille incubator. What is Flanders Bike Valley ? Flanders’ Bike Valley focuses on 6 major topics: Mobility, Sports (involvement of Belgian Cycling Foundation and Belgian Olympic Comittee), Safety and Healthcare, Science & Technology, Industry&Government and Turism. 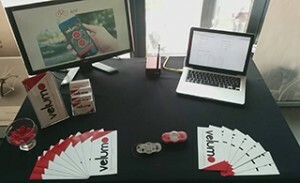 Velumo is an intelligent and connected rear light that helps to find your bike in full racks and prevents theft by using a built-in alarm.